Our optical coatings are routinely tested in our Tenny TR2 Environmental Chamber. 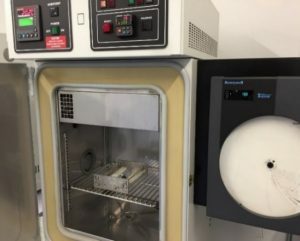 The chamber can vary the temperature from -75o C to 200o C and change the relative humidity from 0 to greater than 95%. The chamber is fully programmable and can store multiple test profiles for repeatable conditions. We can test according to specifications of Mil-675C, Mil-13830B and Mil-48616. 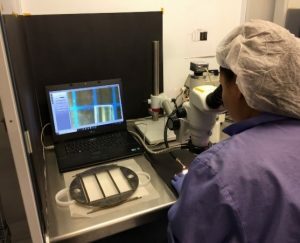 After exposure in the environmental chamber, the coating is then inspected under high magnification for defects. Testing reports and certification are sent to customers upon request. Please include testing specifications in your Request for Quotations. We use the adhesion and durability testing guidelines of Mil-C-675. Adhesion is tested by applying a Scotch brand 810 cellophane tape across the witness sample and pulling briskly. The abrasion of the coating is tested by using an eraser test for severe abrasion or a cheesecloth for moderate abrasion. It is important in these tests to use materials that are clean with consistent application force. There are some metal coatings of unprotected aluminum, gold or silver that are exceptions to abrasion testing. 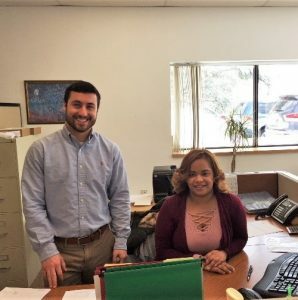 Luisa Reyes and Michael Maldari, our new customer relations team. Luisa and Michael are working together to stream-line all our customer relations processes. They are available to offer top level service and assistance to all our customers. With their new system, customers can expect a rapid response on quotations and inquiries. Give them a call at 978-685-3800. They look forward to working with you.